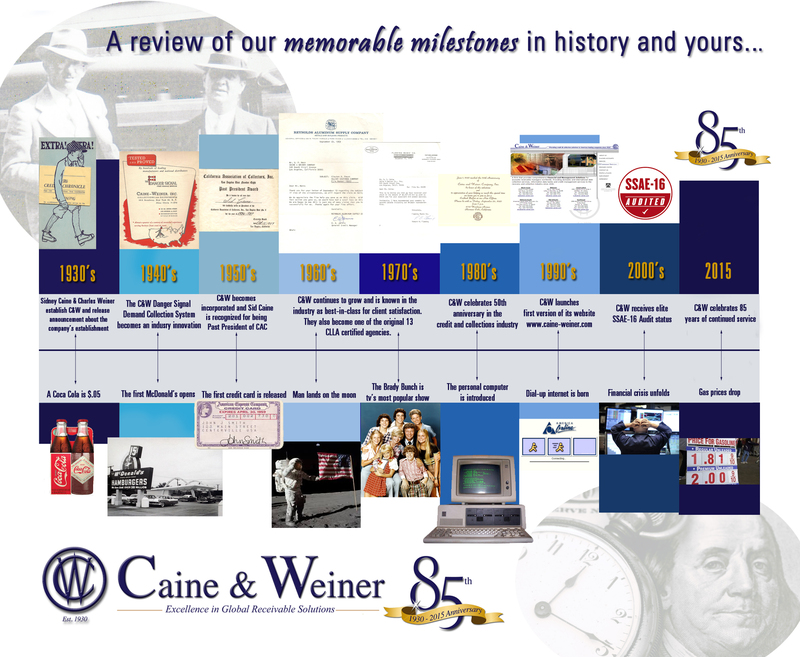 Caine & Weiner is a solution-based accounts receivable management company that provides credit and collection services to America’s leading companies. Our clients are comprised of a broad cross-section of American industry; in fact, 20% of the Fortune 500 companies use our services. When our company began in 1930, Herbert Hoover was in the White House, the stock market had crashed the prior year, and the Great Depression was about to begin. These were turbulent times. Amidst this backdrop, Sidney Caine & Charles Weiner envisioned the creation of a debt recovery service that business people could count on. Client satisfaction, backed with integrity and competence, was their highest priority. Their vision, more than eight decades ago, is the genesis of today’s company. Our investment in applied collection technology includes state-of-the-art call centers, online collection systems, and instantaneous reporting. Our continuous market analysis, monitoring of the latest industry legislation and active participation in professional associations, assures that our clients are the best served in the profession. Eight decades after our founding, client satisfaction and personal service are still basic to our core strength. To these we’ve added stability, client diversity, technological innovation, and a management team widely recognized for its leadership. Well, actually many reasons. Ben Franklin was an inventor, a philosopher, a successful publisher and businessman, the first U.S. Postmaster General, the originator of volunteer fire departments, a diplomat, a flirt (well, maybe we won’t go down that path today), and known as a founding father of the United States.Franklin was of course extremely smart, but what set him apart from his peers was his business and political acumen, often stemming from his humor and inventive imagination. He could make a brilliant political point with humor and get people from the opposite side to agree, save face, and even laugh. Just to highlight some of the roots of his lifelong skill at navigating an always treacherous business and political environment, we’ll look at his “13 virtues,” which he developed as a young man in Philadelphia. They’re timeless. So how do these relate to credit? Credit requires all the skills that Franklin worked on throughout his illustrious life – diplomacy, business acumen, analytic ability, effective administrator, the ability to stand up for a sometimes unpopular cause and go against the grain. You can see the parallels. So you could certainly do worse than to study and imitate Ben Franklin.